Around the turn of the millennium, Yong Jin Kim organized and led the first investigative unit in Korean Broadcasting System (KBS), the country’s public media broadcaster and the biggest media group in South Korea. In 2013, frustrated by the constant need to fight the muzzles put on investigative journalism in mainstream news media, Kim co-founded the Korea Center for Investigative Journalism (KCIJ), an independent outfit specializing in investigative reporting and GIJN member. He is now KCIJ’s editor-in-chief. Kim’s investigations mainly cover topics related to human rights, criminal justice, media and foreign affairs. One of the stories of which he is most proud of is an investigation into how the Korean intelligence agency NIS helped big corporations prevent people involved in trade unions from getting jobs. NIS is one of the most powerful spy agencies in South Korea and, since 2013, KCIJ has followed how the agency has abused its power. Kim’s investigation uncovered the involvement of the agency in the 2012 presidential election, when NIS tried to influence public opinion through social media. Kim is also the author of They Know, But We Don’t, a best-seller based on the cables of the US Embassy in Seoul first exposed by Wikileaks. He also teaches investigative reporting at the Graduate School of Journalism at Semyung University in Jecheon. Yong Jin Kim: Thirty years ago, in 1987, a college student in Seoul died during a police interrogation. Police announced that an officer “smacked” a table during an interrogation and the student “yelped” and died. It was a ridiculous excuse from the officials, but South Korea was under a dictatorship at that time. Security forces framed democracy activists as communist spies from North Korea so they could illegally arrest and torture them. Most people couldn’t do anything other than be silent about the student’s death. One newspaper, however, was brave enough to dig into the cause of the student’s death and found out that security police tortured him to death. This case served as a catalyst for the June Uprising of 1987. After this democratic movement, the 26 years of dictatorship ended with a new constitution and a direct presidential election. A senior in college that year, I participated in the protest, and witnessed for myself how investigative journalism can contribute to changing the society. At the end of that year, I joined the biggest media group in Korea, KBS. About 15 years later, I organized and led the first investigative unit in KBS. However, I kept facing limitations while practicing investigative journalism in mainstream news media, and eventually started KCIJ, an independent nonprofit specializing in investigative reporting, in 2013. I continue to believe that investigative journalism is one of the most important engines in directing the world to a better place. Yong Jin Kim: Concentration and monopoly of media ownership is one of the biggest problems that the mainstream media fails to address. In South Korea, the three biggest media moguls control 70% to 80% of the newspaper and broadcast industries. These right-wing media moguls, who had only monopolized the print and magazine industries in the past, have been expanding their influence on the broadcast industry after enjoying business perks from former right-wing neoliberal administrations. On the surface, it may look like there is an endless number of newspapers and news channels, but most of their messages are similar. They represent interests of the capitalists, big corporations and political powers — and serve the establishment to maintain the status quo. They tend to block voices yearning for fairness in opportunity, a more equal society and any alternative outlook on society. Independent news media and independent investigative journalists have to strive more to expose this facet of the mainstream media. Fake news has arisen as the key challenge to the media lately, but the real problem, in my opinion, is the mainstream media’s framing and spin on public opinion and control of information. 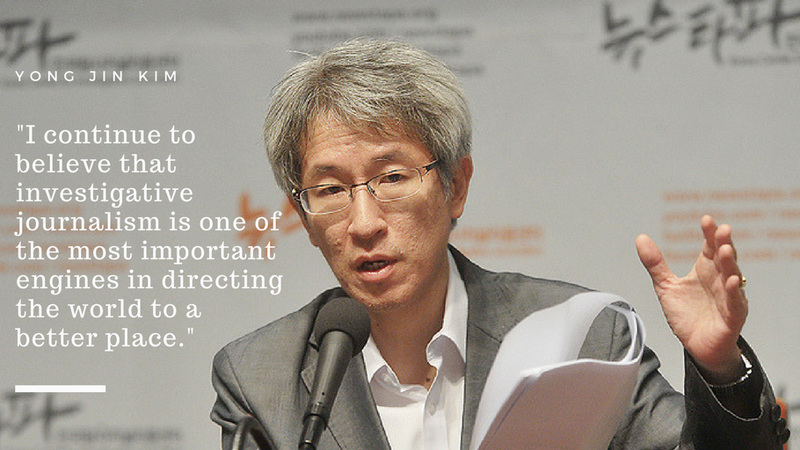 Yong Jin Kim: Independence is the most important thing in journalism. Journalism needs to be free of pressure from any seats of power, such as big businesses, politics and religion. However, most mainstream media are a part of such institutions or under their influence. But we’ve seen some positive changes lately. Investigative nonprofits, free of financial and political influence, have been growing rapidly in the past decade. Membership of GIJN [swelled to] almost 160, which is almost 10 times what I saw 10 years ago. KCIJ, which started in 2013, is run only with donations from members and readers. KCIJ’s financial [model] has inspired journalists not only in South Korea but also around the world as proof that journalism can pursue such an ideal as independence. The rise of non-profit investigative journalism is an important leap forward to recuperating the media system that has been destroyed by monopolization. Q: What would you ask yourself, if you were conducting this interview – and what would you answer? Yong Jin Kim: The question: is your membership model sustainable? The answer: Absolutely. We started out with zero donating members, and now we have 40,000. We started out with five to six unpaid volunteer journalists and now we have 45 full-time staff members. Donating members didn’t increase gradually for us. We saw spikes in donating membership at certain periods. Our donating membership grew by about 5,000 each time we published our offshore tax haven projects, when we covered the Sewol ferry disaster and when we exposed Samsung CEO Lee Gunhee’s prostitution scandal. In the last four years, I felt in my heart that people are yearning for solid and original journalism and are ready to open up their wallet to support it.